Is your schedule too busy for weekly classes? Need help with potty training? Does your dog have behavioral issues that keep you from attending group classes? We have a variety of trainers that can meet with you and your dog for a one-on-one experience at Lucky Paws. We will work around your schedule to make arrangements. Simply fill out a training application and a trainer will be in contact. For the one on one approach, schedule private sessions with us at our facility. 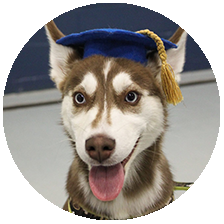 We will focus on whatever area of training or animal behavior interests you!